CESJDS is a place where relationships last a lifetime. For many alumni, these relationships turn into marriages. Browse the growing list of alumni couples and learn more about what brought them together. Jessica and Hank were acquaintances at CESJDS but during the trip to Israel, the casual friendship turned into a relationship. Entering college, they drifted apart, but were reunited by chance when Jessica was visiting the University of Wisconsin. The values and bonds that were a part of their lives at school became a critical element to their love for each other. Jessica is a member of the faculty at George Washington University Law School and Hank is a concert promoter and talent representative. 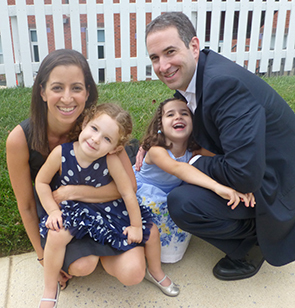 They have two children, Sellah and Simona, live in the Washington, DC area, and are committed to Jewish education.